Crestwood did everything right to capture their first ever NPA National Championship. Winning every game by double digits, the Lions left no doubt as to who earned it this year. Jahcobi Neath followed up his MVP performance by also capturing the Biosteel All-Canadian Slam Dunk Title and MVP for Team White, solidifying a legendary high school career as he heads on to Wake Forest in the fall. Following an MVP Performance at the OSBA championships, TRC Wolfpack’s Avan Nava has committed to St. Francis Xavier and will begin his U-Sports Career in the fall. He will be joining his TRC head coach Tyrell Vernon, who announced he will be taking over as head coach of St. FX just a few days prior. Edge enters the top 5 for the first time since week 1 after knocking off the defending 2-time NPA national champs CTA. Fofo Adetougan did everything he could to held send Edge to their first ever national title game, and most definitely put himself on the radar in front of all of the college coaches in attendance for the NPA nationals. A disappointing end to the season for the 2-time defending NPA Champs, as they just couldn’t hold off Edge in the semi finals. Regardless, CTA still managed to have one of the highest winning percentages of any Canadian Prep program, solidifying their position as an elite program in Canada. With alumni Taryn Todd and current player Noah Ngamba participating in the Biosteel All-Canadian and Futures games respectively, Vaughan can be proud of a successful season that saw their kids get top level exposure. RISE Prep rounds out the year remaining in the top 10. With the promotion of Head Coach Jeremie Kayeye to TRC, Rise will welcome Mario Celebre as their new Head Coach for the 2019/20 season. As a feather in the cap on such a successful season, Miguel Tomley managed to capture the Biosteel All-Canadian 3-point contest title. Meanwhile, point guard Josh Noton has also committed to Hill College in the NJCAA for next year. TBA managed a first round bye after a default over Saint Laurent, then managed to knock off higher ranked RNS before finally falling to the eventual NPA champs Crestwood Prep. With Amir Golizadeh moving on to Chicago State, there will be space for scoring on this roster heading into next season. For now TBA moves up on the season’s final rankings for a strong finish. King’s Christian Finishes their year with a 16-12 overall record, while managing to send their top PG Luka Sakota to Harvard in the fall. After being given a first round bye, RNS was unable to knock off TBA in the NPA quarter-finals. Regardless, Kellen Tynes, Shyheim Malcom, and the rest of Rothesay have a ton to be proud of this year thanks to a strong regular season performance. Tynes was also honored this past weekend with a Biosteel All-Canadian appearance. Both players also managed to gain first and second team honors for the NPA. Despite a tough finish to the year, Southwest has plenty to be proud of, having managed to get as high as #8 in the national rankings, behind the play of OSBA MVP Kobe Elvis. Alec McGregor also managed to win Sportsman of the Year for Southwest to top it off. Not much else can be said about going viral. That’s exactly what Shak Pryce and the rest of Pine Ridge did on their way to repeating as OFSAA champs. It didn’t come easy though, as upstart LaSalle gave everything the Pumas could handle and then some. If it was not for the shot now seen around the world, who knows how overtime would of went in a game where the largest lead was six points. It was all settled in regulation however, and brought a new level of exposure to Canadian HS basketball in the process. LBA had a battle on their hands in the first round of the NPA Nationals with a revitalized Oakville Prep, and were unable to advance in heartbreaking fashion. This was a year plagued with challenges for an other wise very talented roster, and their is no doubt that a ton of work is already under way for next year. A playoff berth, a winning overall record, and a top 20 finish in national rankings, not a bad result for a roster that experienced almost a total rollover from last year. The Blues are only going to get better as 2019/2020 comes around after the addition of Marcus Moore for next season’s roster. GTA Prep showed just how dominant this young roster could be in their first round win over SBA at the NPA Nationals. However, their youth also showed in a tough matchup against CTA the very next day. A quarter finals appearance was ideal for this team regardless, and they can hang their hat on sending Andrew Robinson to the Biosteel Futures game. A 1-1 NPA Nationals keeps Halifax where they are to end the year. Halifax looked great in their first matchup against Northstar, but were unable to keep up the momentum against eventual finalists Edge School in the Quarters. The LaSalle Black Knights may have only won a silver at OFSAA, but they clearly showed just what this team is capable of when fully healthy. The highest winning percentage in Canada, smallest margin of victory at ‘AAA’ OFSAA was 9 points against a well known Pickering program. To top it off, it took a last second shot from one of the best HS players in the country to finally take them down. Cole and Luka Syllas can both look back from this year and know they helped create what could be a new dominant program in Ontario. For head coach Rom Severino, it’s simply next man up come the Fall 2019. 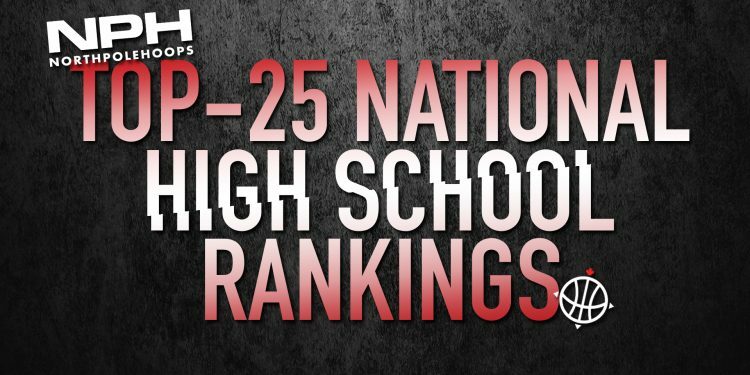 Lincoln Prep concludes their season in the top 25 in national rankings, while managing to send a number of their players to promising collegiate prospects. SBA kicks off their NPA schedule against GTA Prep. Look for this to be the most interesting matchup in the first round of the NPA Nationals, where size meets speed. Oakville Prep managed to climb back into the top 25 in the final week of the year after knocking off heavily favoured LBA in the first round of the NPA Nationals. Jordan Persad played like a man possessed in Oakville’s two games, and has certainly risen his stock after being named NPA “Newcomer of the Year”. The Toronto District champs have been on the bubble throughout the year, but they finally break through at the 24 spot after a bronze medal performance at OFSAA. Led by Ree Compton and Flynn Gilmour, this team has taken on some of the top competition the GTA has had to offer this year and more than held their own. ‘AAA’ OFSAA host Saltfleet round out this week at the 25 spot after finishing 4th at the provincials. Steven Lagah was an impressive standout all tournament for the Storm, while Thomas Matsell managed to drop 19 points in the bronze medal game. Slatfleet for at least this year, can claim bragging rights finishing the year as the top team in the Hamilton region over rival powerhouse Cathedral. Have Your Say…Who Should be in the Top 25?